Rae Mike, 95, of Ann Arbor Michigan, died on 03 April 2019. 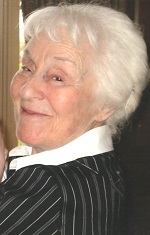 The Funeral was held at Temple Beth Emeth, 2309 Packard St, Ann Arbor, MI 48104 on Friday, 05 April 2019 at 10:00 AM . Rabbi Josh Whinston officiated. Interment at Arborcrest Memorial Park.